I have had a long fascination with the English Civil War stuff. It's colourful. 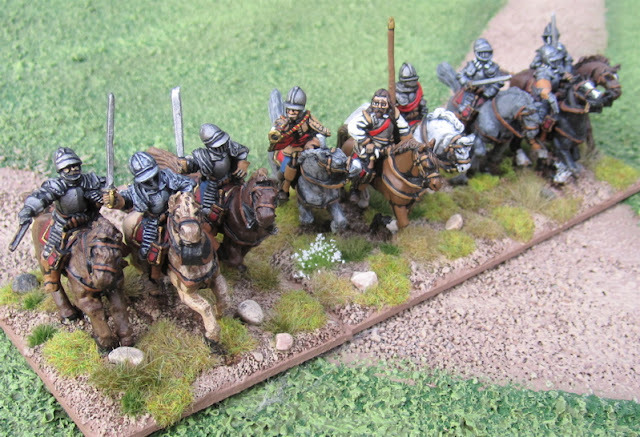 The elements at play are relatively simple - Pike, Shot, Horse, Dragoons, and Artillery. The Thirty Years War had all of that, I suppose, but I always found it all so confusing... Some of the earliest historical miniatures I owned were old Wargames Foundry English Civil War figures. I sort of have two separate, but similar collections for the period. One on multi-figure bases for fighting big battles using the DBA Extension for 1500 – 1900AD (or possibly Neil Thomas' One-Hour Wargames). The other consists of figures are based individually for skirmish gaming - originally (the first few figures I had, at least) I planned to use them with Once Upon a Time in the West Country, later I might have used them with Savage Worlds, more recently I planned to use them for Flashing Steel or En Garde, and most recently of all, they have been expanded and reorganized for fighting in units for The Pikeman's Lament. The forces I use for the English Royalists and Parliamentarians are, for the most part, fairly generic and could be used as one or the other in most cases. The Cuirassiers and the Regiment of foote in orange are from Old Glory. The regiment in red are some figures I modelled and cast myself... but I seem to have lost the mould and masters!? Here's what a Regiment of Foote looks like - two stands of pike and two stands of musket. Another Regiment of Foote. Figures from Old Glory. 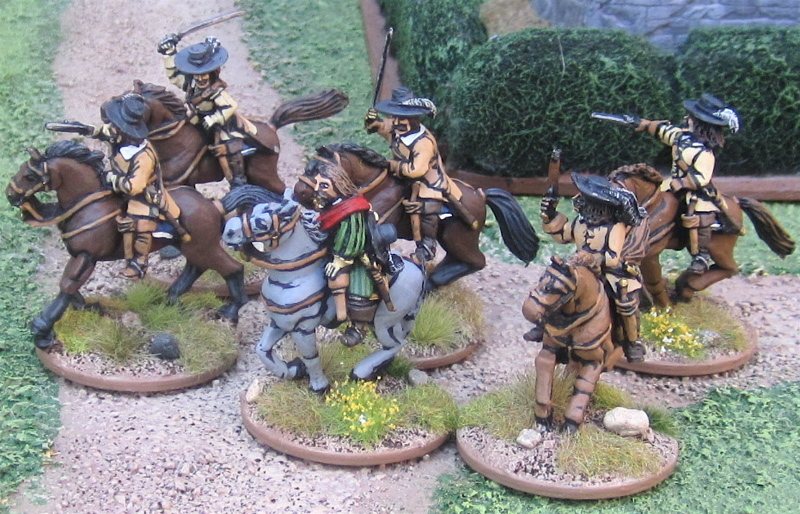 Three elements (or one unit) of Cuirassiers from Old Glory. 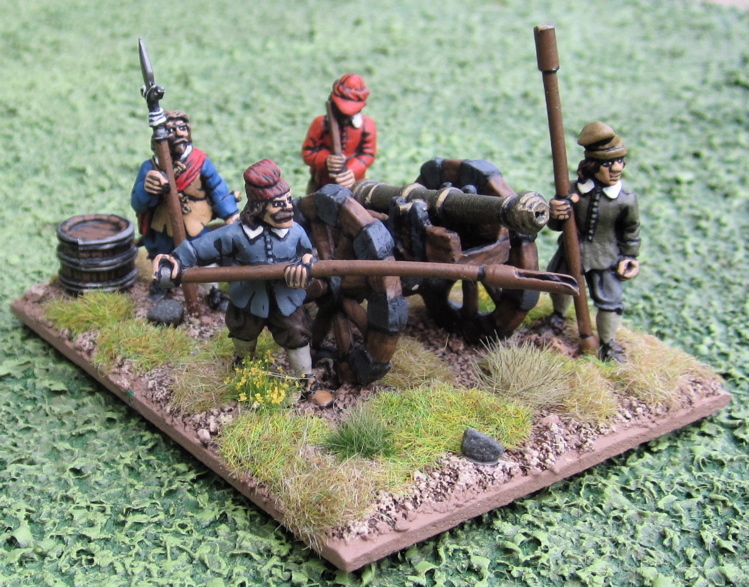 English Civil War gun and crew - The crew is from the Assault Group, I'm not sure about the gun. These are all the individually based figures I have for skirmish gaming. 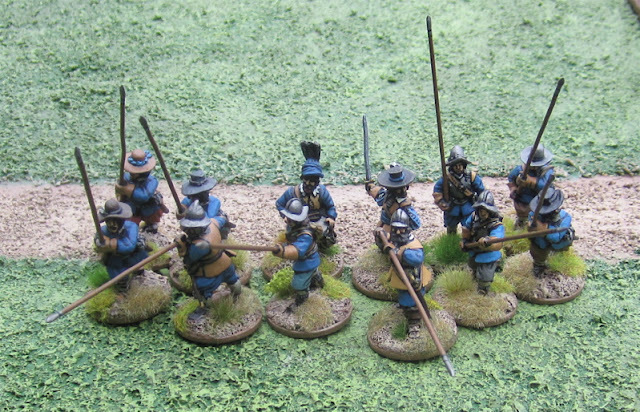 They are currently in the process of being reorganized in units for The Pikeman's Lament. General from Wargames Foundry. I painted this figure over 25 years ago. I've rebased him a number of times, but can't be bothered to repaint... I don't have a unit for him just yet, but I suppose he could be substituted into any mounted unit. 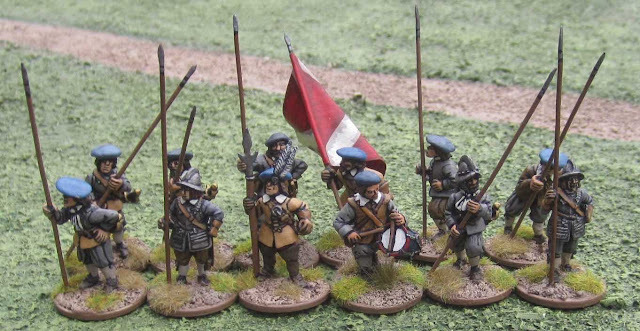 Unit of Pike (in Red) - figures from Old Glory. Unit of Shot (in Red) - figures from Old Glory, Dixon Miniatures, Perry Miniatures, and a few of my own homemade figures. 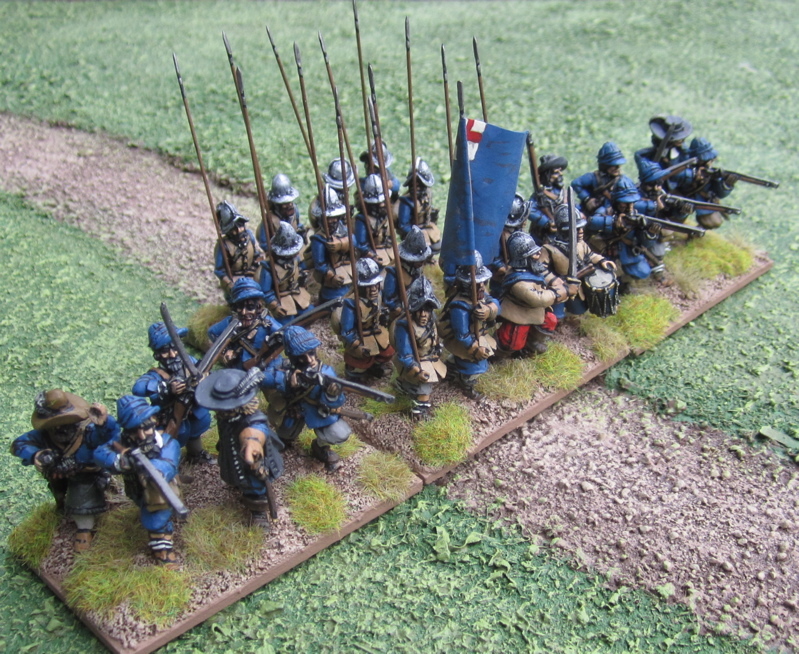 Unit of Pike (in blue) - figures also from Old Glory. Unit of Shot (in blue) - figures from Old Glory, Dixon Miniatures, Perry Miniatures, and a few of my own homemade figures. Some more Musketeers from Old Glory. A unit of dismounted Cuirassiers - - to be fielded as as "aggressive" Forlorn Hope – a 0 point upgrade that removes the ability to shoot, but increases their Stamina and Attack Value. All but one is from Wargames Foundry (four of which were painted over 25 years ago! 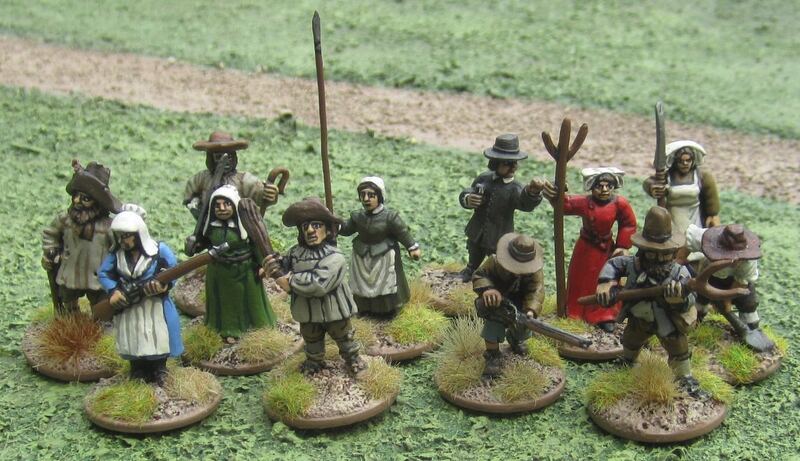 ), the odd man out is actually a Dixon Miniatures figures from their Flodden line?! I figured it was close enough – could be some poor old chap that couldn’t afford new armour and swords and had to go into battle wearing his granddads armour…. Another unit of dismounted Cavalry - to be fielded as a Forlorn Hope. 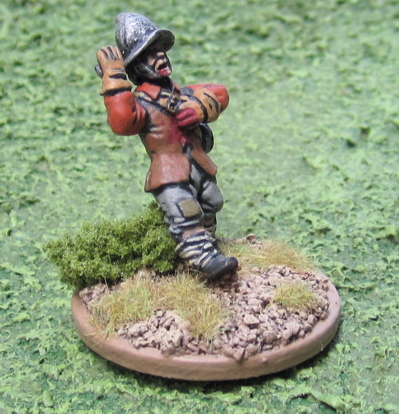 - figures from Wargames Foundry and Dixon Miniatures. 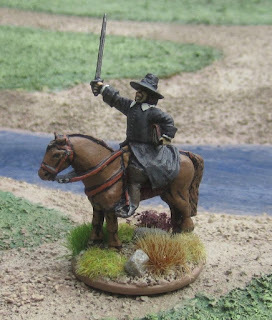 English Petard Storming party from Warlord Games – This could also be fielded as a Forlorn Hope - counting the two man petard carrying party as a single figure..
Light Cavalry - also from Old Glory. These could be fielded as either Gallopers or Trotters. Heavier Cavalry - figures from Old Glory plus one from Perry Miniatures. 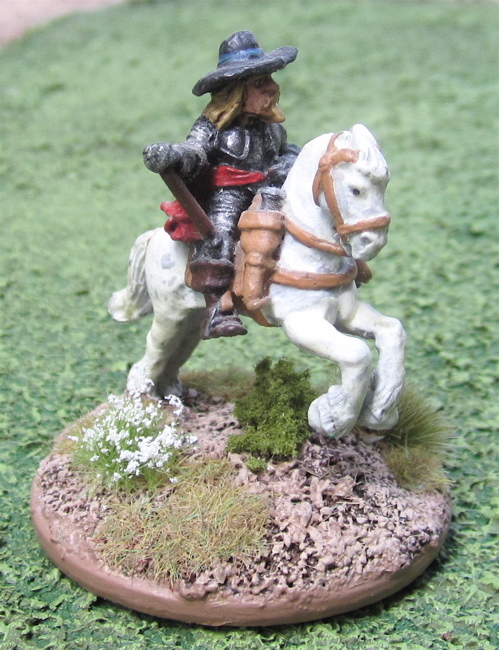 Still have another Regiment of Foote to finish up and perhaps need some heavier cavalry. (click on the picture for a slightly bigger version). The three Regiments of Foote together in a brigade. One Regiment of Foote (from Wargames Foundry) and some "Mossers"(from Old Glory). 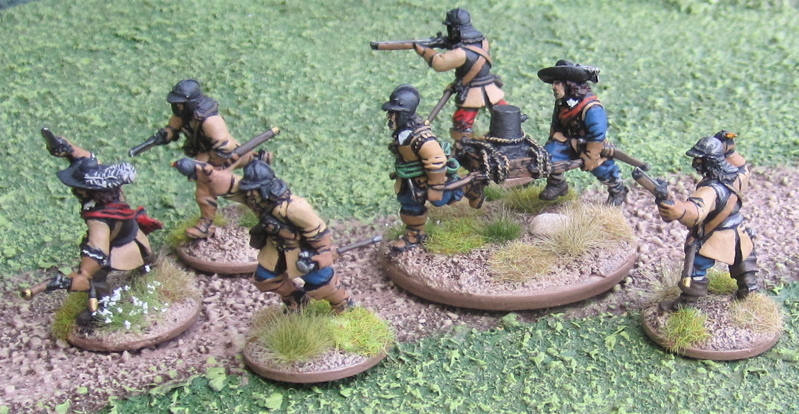 The Third Regiment of Foote - also from Renegade Miniatures. 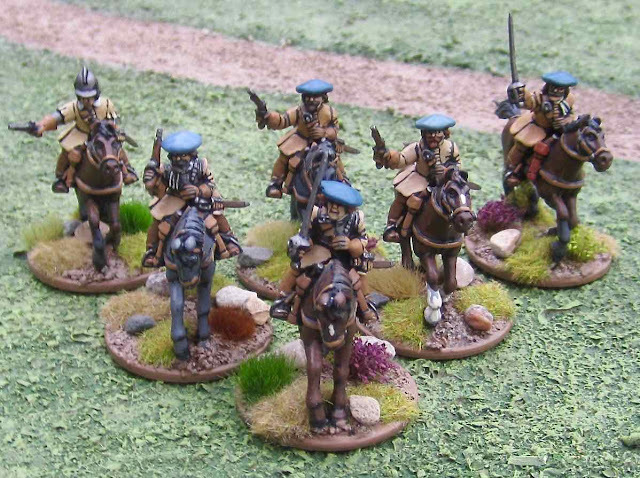 Scots Horse - three elements of Cavalry or a single unit for big battalion battles. 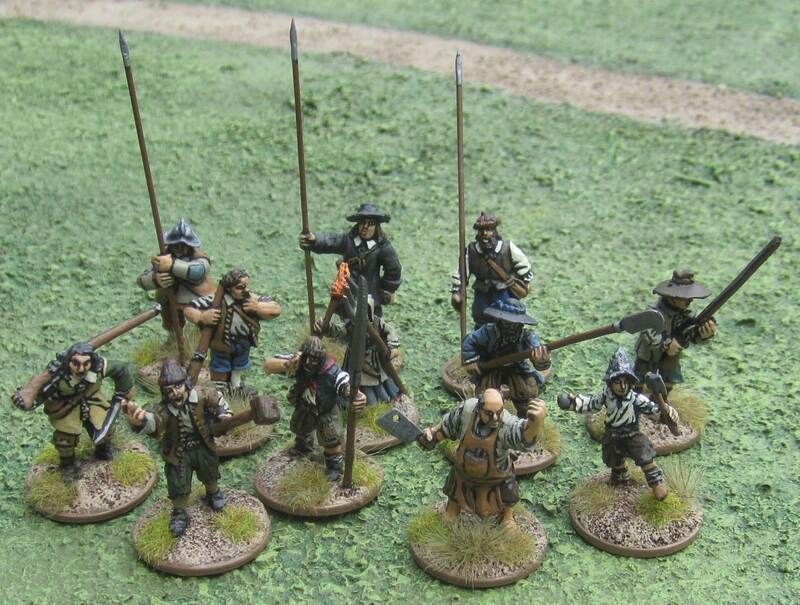 The figures are also from Old Glory Miniatures - with the exception of one fellow in the middle of the centre element – he’s from Dixon Miniatures. These are all the individually based figures I have for skirmish gaming. 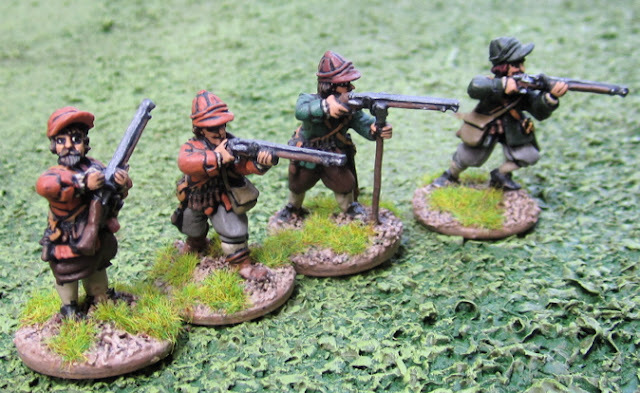 They include minatures from The Assault Group, Dixon Miniatures, Perry Miniatures, and Renegade Miniatures. 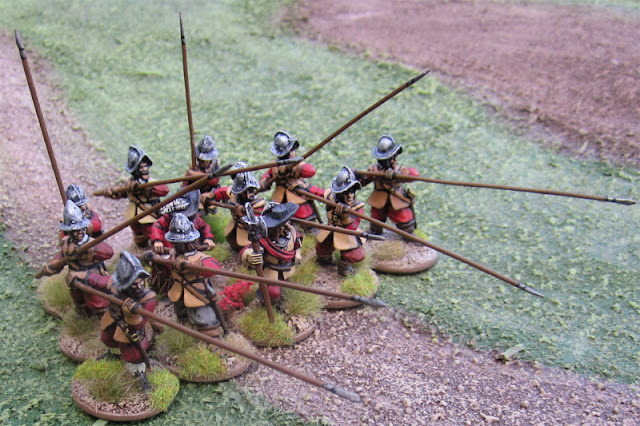 They have been organized in units for The Pikeman's Lament - though could easily be used in any other skirmish or role-playing game. The entire force. There is about 34 points worth of stuff here - give or take (many could be upgraded or downgraded, depending on the situation). I think most often this will be fielded as two units of Horse, two of Pike, and two Shot for 24 points. 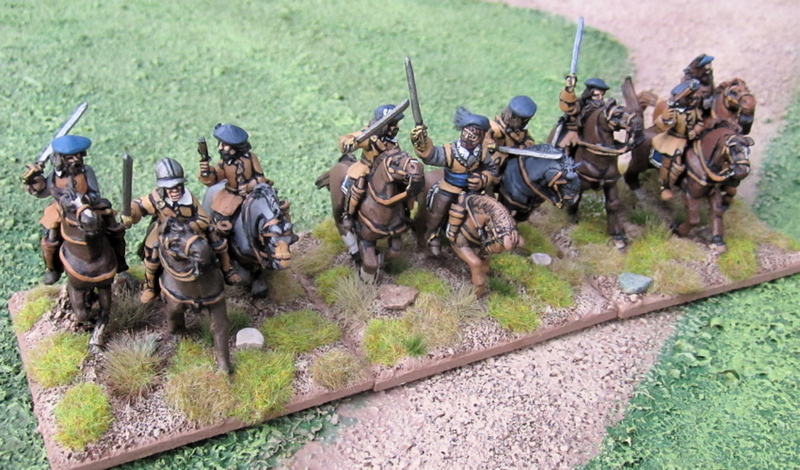 A unit of dismounted Scots cavalrymen (that would would be fielded as a "Forlorn Hope" in The Pikeman's Lament). All of the figures are from Dixon Miniatures. 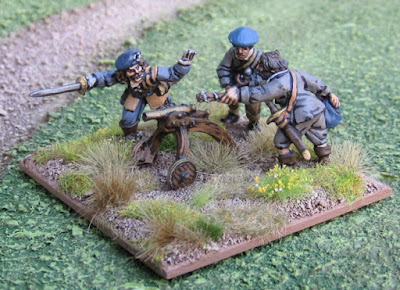 Unit of Shot #1 (figures from Dixon Miniatures and The Assault Group). Unit of Shot #2 (figures from Dixon Miniatures, Renegade Miniatures, and The Assault Group). Unit of Pike #1 (figures from The Assault Group, Dixon Miniatures, Perry Miniatures, and Renegade Miniatures). 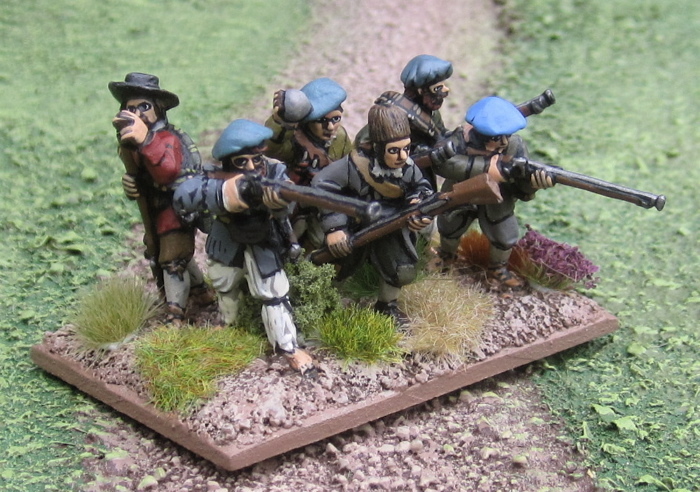 Unit of Pike #2 (figures from The Assault Group, Dixon Miniatures, Perry Miniatures, and Renegade Miniatures). Two casualties/morale failure tokens - one is form Dixon Miniatures, the other is form Perry Miniatures. This force is more or less complete. If I were to add anything to it, I might pick up some Scottish civilians (I think Redoubt Enterprises makes a few Scottish camp followers?). Beyond that perhaps some Scottish Dragoons or another unit each of Pike and Shot - or just two more units of Shot - so the company could be fielded as a pure foot unit (without a Forlorn Hope). If I got playing this regular enough to add more...? 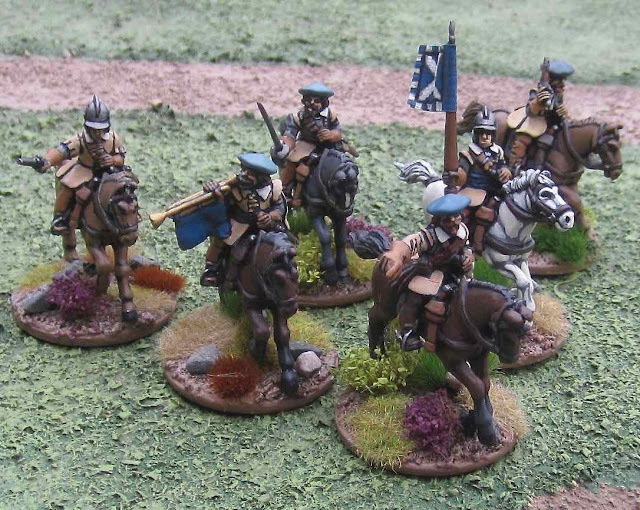 I'd pick up more units of Horse from The Assault Group to field an entirely mounted company. 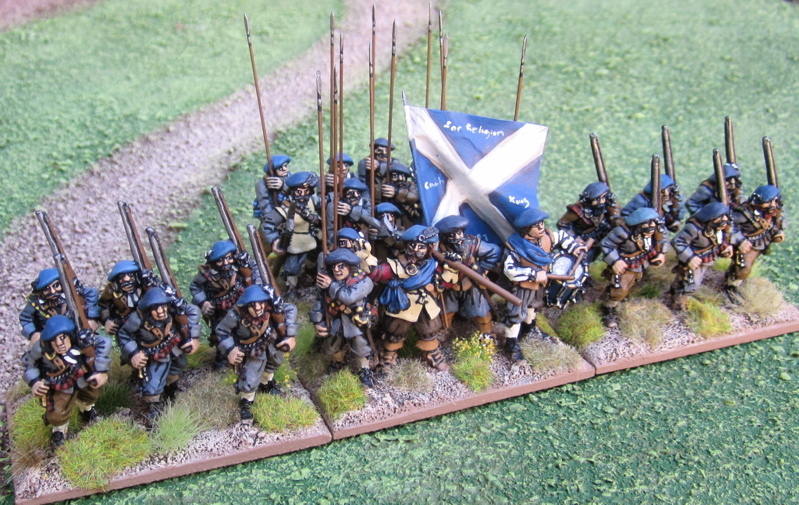 I am also working on forces to represent the Scots Royalists under James Graham, the Marquis of Montrose - for both DBA big battles and skirmishing forces for for The Pikeman's Lament. both forces will include a mix of Irish Catholics and Scots Highlanders. These are all the individually based figures I have for skirmish gaming. They are currently organized as units for The Pikeman's Lament. 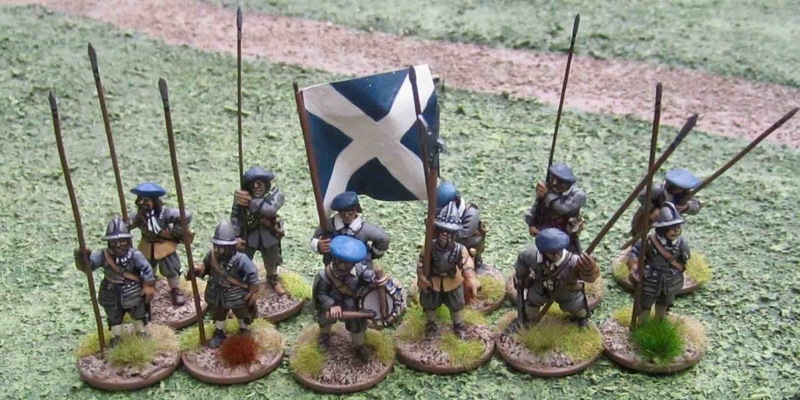 Stay tuned for MORE pics of Irish and Scots Highalnders! 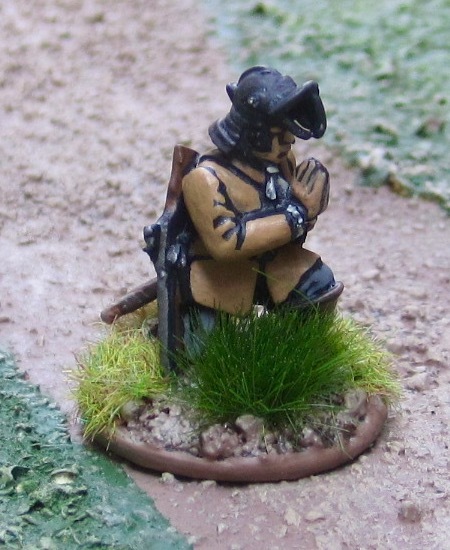 Civilians in The Pikeman's Lament take the form of "Clubmen". These would be villagers who volunteered to defend their village against raiders – from either side – looking for “contributions” for their respective armies. 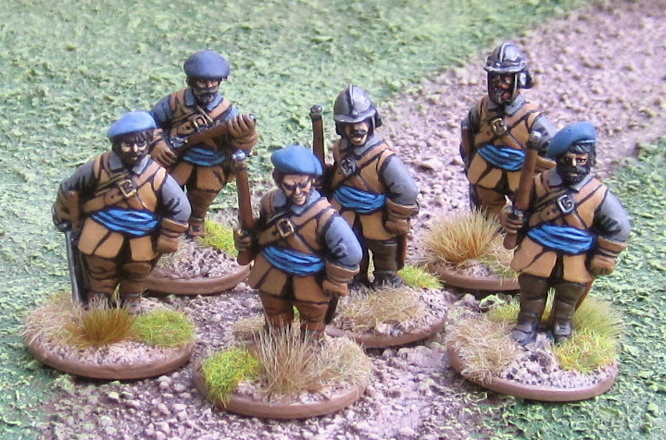 A unit of Clubmen from Redoubt Enterprises. Another unit of Clubmen from Warlord Games. Still more Clubmen! This unit is made up of a mix of figures from mostly from Wargames Foundry and Casting Room Miniatures, but there are also figures from Warlord Games and Dixon Miniatures...? 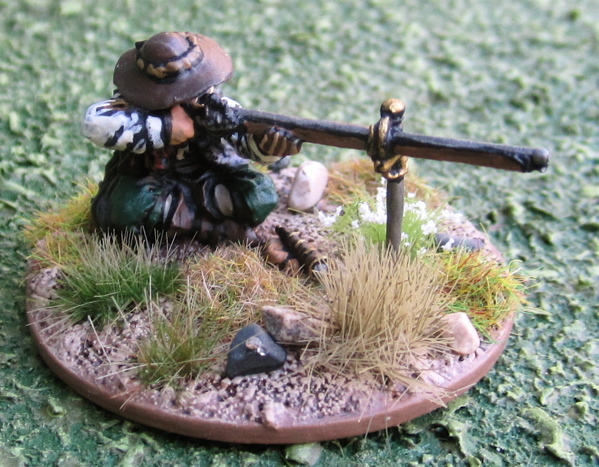 Marksman - also from Warlord Games. I'm not entirely sure how to use this fellow in The Pikeman's Lament...? 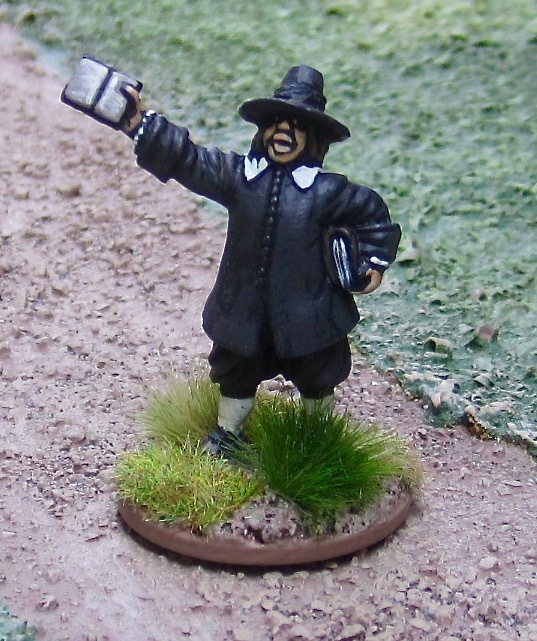 Dour Puritan Preacher from Redoubt Enterprises. 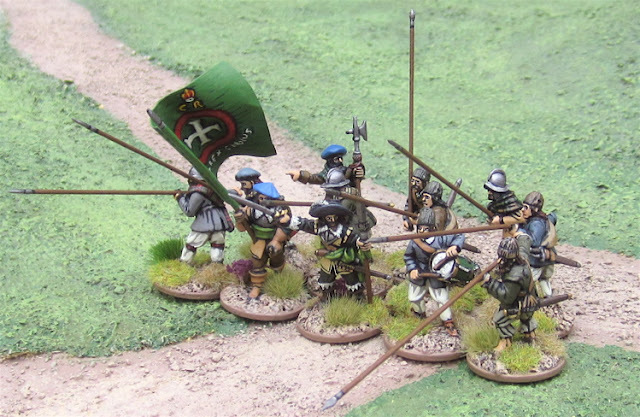 There are rules in The Pikeman's Lament for adding Agitators, Priests and Heroes to units! Mounted version of the Puritanical Preacher above. Absolutely fantastic collection. Very jealous! Thanks, Mike! 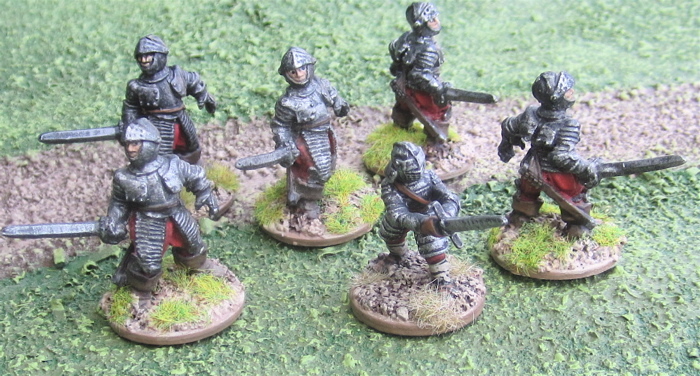 I hope these guys will soon be seeing action again in the new year when Pikeman's Lament is released. Yeah Old Glory can be a bit "hit and miss". The ECW stuff is probably not the best they have to offer, but it's definitely not the worst! There are units that are completely made up of Old Glory figures above - I don't think they look too bad all painted up (mind you, I am not nearly as fussy as some!). There are other units where they are mixed in with others and I think they mix in well enough that you really have to look for them to pick them out. So I'd say "not bad" over all.